The novel opens in 1917 with our cunning protagonist, May Dugas, standing trial for extortion. As the trial unfolds, May tells her version of events. In 1887, at the tender age of eighteen, May ventures to Chicago in hopes of earning enough money to support her family. Circumstances force her to take up residence at the city’s most infamous bordello, but May soon learns to employ her considerable feminine wiles to extract not only sidelong looks but also large sums of money from the men she encounters. Insinuating herself into Chicago’s high society, May lands a well-to-do fiancé—until, that is, a Pinkerton Agency detective named Reed Doherty intervenes and summarily foils the engagement. Unflappable May quickly rebounds, elevating seduction and social climbing to an art form as she travels the world, eventually marrying a wealthy Dutch Baron. Unfortunately, Reed Doherty is never far behind and continues to track May in a delicious cat-and-mouse game as the newly-minted Baroness’s misadventures take her from San Francisco to Shanghai to London and points in between. As the narrative bounces back and forth between the trial taking place in 1917 and May’s devious but undeniably entertaining path to the courtroom—hoodwinking and waltzing her way through the gilded age and into the twentieth century—we're left to ponder her guilt as we move closer to finding out what fate ultimately has in store for our irresistible adventuress. I wasn't able to connect with May. I would have liked to have understood her better, to hear her thoughts and justifications for her actions. I may have liked this book more if I had a clue about May's motives. Is she trying to help support her family by conning and conniving her way through life? That reason didn't hold up for me as she treats her family members shabbily at best. Parlor Games did contain enjoyable sections. I was intrigued by the extortion trial. Those were my favorite parts of the book and the only place I felt I was learning a bit more about the characters. That was what I wanted more of. I loved the idea of this book because I love learning about history and real historical characters. Unfortunately this book fell flat for me. 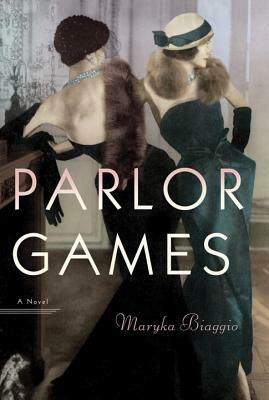 Parlor Games was apparently inspired by the real life of May Dugas. I'm wondering if a nonfiction account would work better for me? Sadly, this book did not. That always happens to me ;) It was an interesting book, even if it wasn't really my cup of tea. I read another review where the writer really enjoyed this book, but it's always good to hear both sides. Thanks for your thoughts, Jennifer! I've seen great reviews of this one too! I really do see how some people would love it. I sure wanted to! It does sound as though a non-fiction would have worked well in this case. You need to know motives to understand and appreciate the character (whether you end up liking them or not). While I can see how the agency could have tracked her (likely because I've been watching spy shows recently...) the convenience and predictability of the foils I can see being annoying after a while. Good, and ironically considering, detailed review! This sounds like a fun book, but not really something I would enjoy. I don't think detectives tracking glamorous ladies are really my thing, and I think I would also want to know more about the motivations. Maybe May just enjoyed the glamour and the attention and got caught up in social climbing for her own sake? Disappointing because the opening line to your review made me want to read this book asap! Pass....thanks for the great review of this one though!